Withings has just announced two new fitness trackers at CES 2019, and one incorporates a major innovation that we've previously only seen on the Apple Watch Series 4 in a smartwatch. The Withings Move ECG features an electrocardiogram monitor, a first for a hybrid smartwatch. At first glance it looks to be a traditional watch, but the hidden tech inside the Move ECG will help you monitor your step count and overall heart health. The ECG monitor allows you to detect heart conditions like atrial fibrillation that without this sort of monitor can be difficult to spot. Like most other smartwatches and trackers, the Move ECG can take regular heart rate readings as well as track your calories burned, pace, distance, workout routines and elevation. A small gauge on the watch face itself will tell you how close you've come to your daily step count goals, and will also monitor your sleep with stats on the duration and interruptions throughout night available. According to Withings, the battery is set to last an entire year, so you won't have to take it off at night to recharge it. The watch itself is a similar style to the Withings Steel HR, but it comes in a variety of bold colors, including a black version. You'll be able to buy the watch with either a black or white watch face, plus there's a selection of bright and colorful straps to choose from too. The Move ECG is set to launch during Q2 2019, which means we may see it any time between March and the end of July. It's set to cost $129.95 / £129.95 (about AU$230). Whether or not you'll be able to use the ECG feature in your respective country comes down to clearance from respective government bodies. In the US it'll need FDA approval, and Withings can't currently confirm that. Although we've previously seen an ECG monitor on the Apple Watch Series 4, that's a feature that is still limited to the US. This is the first consumer wearable that's compatible with Android phones capable of an ECG reading. The company has also announced a less feature-rich watch called the Withings Move. This is a more affordable activity tracker that can still monitor your health and give you limited workout information. It's water resistant up to 50 meters and there's connected GPS if you want to take it for a run. There's no heart rate monitor on this watch though, and obviously it doesn't feature an ECG monitor either. 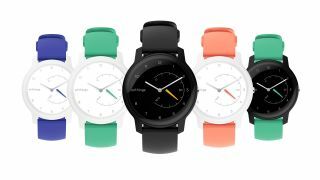 Battery life is estimated to be 18 months on the Withings Move, and the company has given a variety of customizable looks for the 38mm watch with five color options set to launch from early February in the US and UK. We don't currently know the release schedule for other countries. The Withings Move will cost $69.95 / £59.95 (about AU$110), and you can pre-order the watch now. The company also announced a new medical product for its line-up called the Withings BPM Core. This is a cuff to measure your blood pressure, alongside an ECG monitor and a digital stethoscope to monitor your heart health. It's not dissimilar to a blood pressure cuff you may have used at a doctor's clinic, but this is a portable option that you can keep at home or take away with you when travelling. It's set to launch later this year – an exact launch window has yet to be determined – and it will cost around $249.95 / £249.95 (about AU$450). The BPM Core isn't a device for fitness fans, and instead is meant for medical purposes but if you need to keep an eye on your heart health it may be a useful tool to have at home.